Enjoy a cold beverage, great food and friendly conversation after a round of Golf in your very own 19th Hole Sport Bar with Personalized Golf Wall Sign. Our Personalized Golf Wall Sign is the perfect gift for Father's Day, Birthday, Christmas and just because! Includes FREE Personalization. 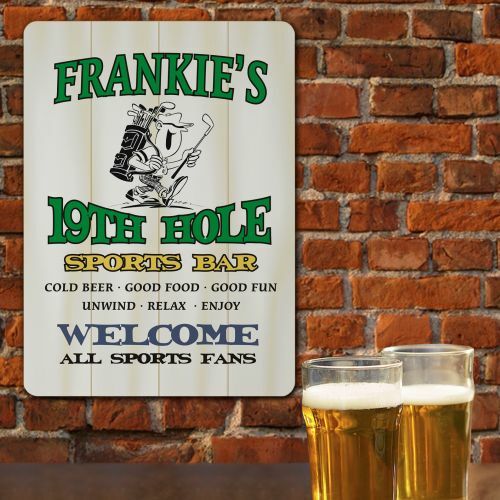 Your Custom 19th Hole Sports Bar Wall Sign measures 9"x 12.5" and includes easy mounting accessories. Our Golf Wall Sign is a high gloss .25" thick tempered hardboard wall sign. The Personalized Golf Wall Sign arrives with plastic peel and stick hangers for easy mounting. Personalize your Golf wall sign with any name. This was a unique gift that turned out great with personalization! It was also a great value!